We are pleased to announce the launch of our E-shop site! After months of hard work and collaboration with our true value distributors, we are delighted to officially announce the launch on 24th of October 2018. The new E-shop site URL is https://shop.vessel-europe.com/. 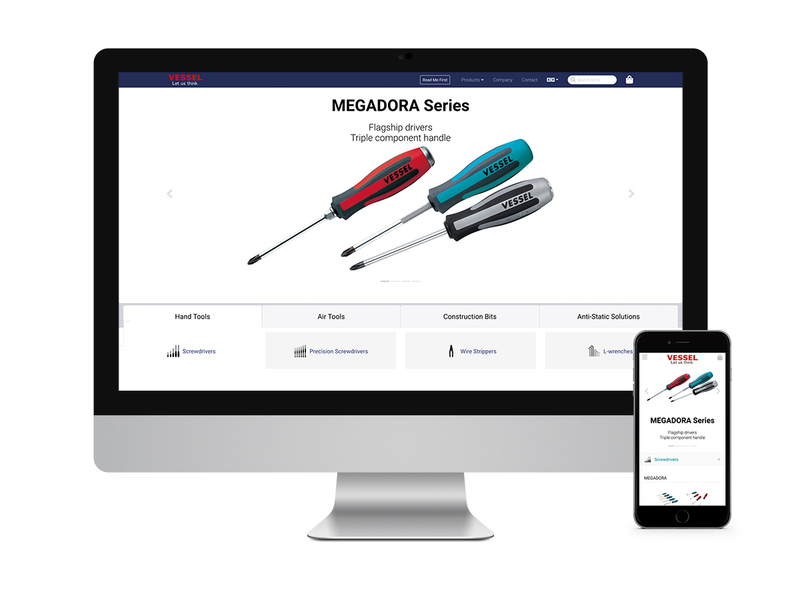 You can now create your order for VESSEL tools with this site. 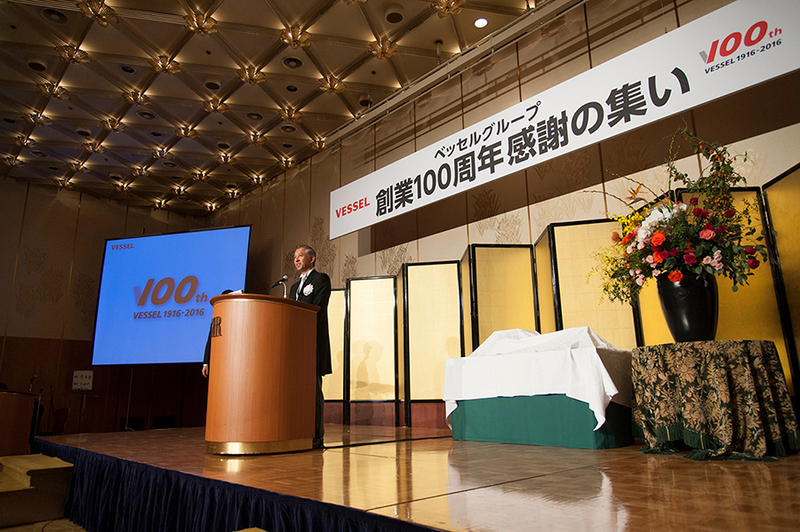 At present, our goal is to turn to the challenges of tomorrow. Based on our experience and our high quality standards, we now wish to accelerate our presence on a global scale. Already present in Europe on the industrial sector, for many years, we have been able to weave a network of distributors who plebiscite the quality of our products. Our goal, now, is to strengthen and develop these collaborations, in order to further improve and tighten end user satisfaction. We are very proud to have been interviewed by the Japan Times as it was a very good opportunity to talk about our company development in France & Europe. We tend to expose our vision and some strong partnership that we tend to extend day after day. Feel free to read the article at Synergy Media Specialists' website. History of our bits goes back to the development of Automatic Spiral Ratchet screwdrivers back in 1958 at our plant. When the industries of electric home appliances and precision camera got kicked off with the speed of its spread in the markets started in terms of its production and the usage installed in every house in Japan and this development has made tremendous demand of more precision and engineering production. We at VESSEL invested heavily and developed various fastening bits for robotic technology, which has doubled the demand and our capacity to meet such a sharp raised consumption. Now we have also lined up new phase of another high quality specifications to solve various problems in terms of eco friendly era. Service Kits for General Pro-Use, Wood & Metal Working, Hardware Applications, Automotive, Motorcycle, Watch, Glasses and, further more. Hand screwdrivers are our flagship tools since we were born back in 1916. We saw all development of hand operated fastening jobs in the world. Less fatigue Super cushion handle, Non-slip Wood-Compo handle, Precision Micro screwdriver, including Non-Conductive Adjusting Screwdrivers and, further more. Covering not only for automotive aftermarket but also more industrial specifications for light weight and high power blow output including Thrust Operation available model such as GT-3800LX, which well balanced designed Impact Wrench is free from the danger of airhose tangled since clear straight airhose lined from Air Compressor. Smooth and Stable Torque fastening made possible with reduced noise. Enjoy rich oiled lubrication turning ! Low noise Stable Grinding has solved the problems with precision power motor for accurate and speedy job. Unique Hanging air blow guns pointing any corner. Precision and micro traverse control nipping secured due to its accurate mechanism and sharp nipping blade function with highest cutting material selection. Ideal for such heavy cut-off application! Fully Lined up for Static Elimination solution! VESSEL models are the World Standard required at Railway Maintenance. Mighty Gasoline Engine Powered Impact Wrenches for the maintenance and facility installment over the world railway system since 2000. VESSEL EUROPE is part of the VESSEL JAPAN group of companies and was incorporated in 2010. 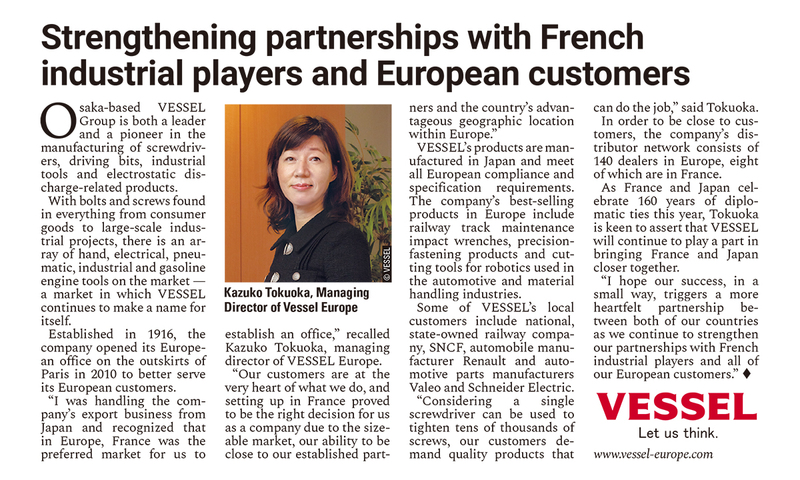 (Vessel Japan celebrated its Centennial anniversary in 2016) Vessel Europe is located on the outskirts of Paris and was established to meet the European specifications for tools using both traditional and the newest manufacturing technologies available, for which we would like to thank to the great partnerships of the European industrial players. Here at Vessel Europe web site we take privacy seriously and will only use your personal information to administer your account. When you submit a contact form, we collect your name, company name and your email address so that we can correspond with you. When you create your VESSEL account to request quotations and information of our products we collect your name, social informations*, your email address, your postal address, your telephone number, your fax number* and your website's URL* so that we can correspond with you. Your personal data for VESSEL account will be stored in the website's database. You can view, update or delete your personal data at any time from your VESSEL account page after logged in. The data we collect will be processed anonymously and "Data sharing" is disabled. We don't use other Google services in combination with Google Analytics cookies.